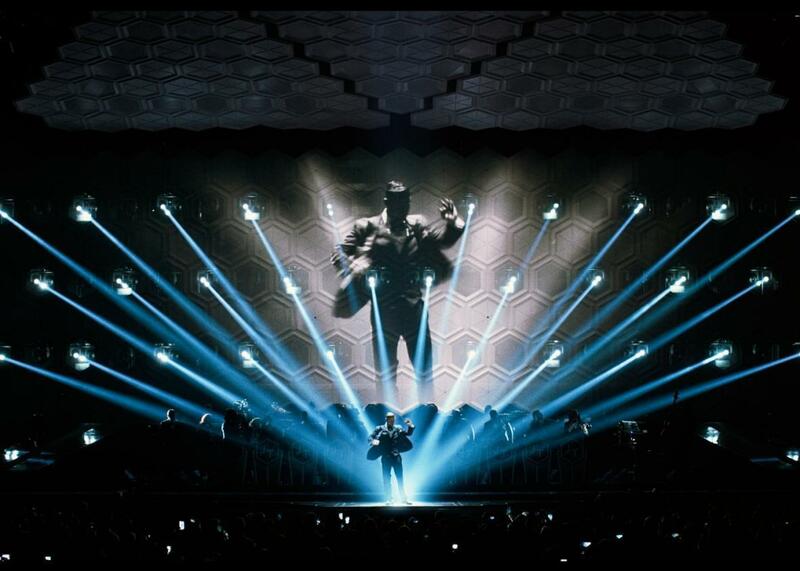 Justin Timberlake + the Tennessee Kids shows Jonathan Demme is our best director of concert films. Justin Timberlake + the Tennessee Kids, now streaming on Netflix. Jonathan Demme died on Wednesday at 73. In 2016, Sam Adams wrote about why Demme was our greatest director of concert films. Part of what makes Jonathan Demme the greatest director of performance films the movies have ever known is the breadth of the performances he’s captured. He brings as much inventiveness and visual intelligence to the wooden table and microphone that comprise the entirety of the set for Spalding Gray’s one-man show Swimming to Cambodia as he does the elaborate pageantry of Talking Heads in Stop Making Sense. But you could also boil it down to a single moment in Justin Timberlake + the Tennessee Kids, which was released via Netflix last week. The movie captures the last shows on Timberlake’s 20/20 Experience World Tour, in front of an adoring audience at Las Vegas’ MGM Grand. But despite the victory-lap setup, Demme frames the concert as just another day on the job, especially for musicians and dancers in Timberlake’s expansive retinue. Timberlake is the movie’s center, but it often seems more interested in the people off to either side. During “Let the Groove Get In,” Timberlake strides out onto a transparent catwalk stretched over the audience, the better to show off his impressive dance moves. But when it’s his turn to hold the spotlight, Demme cuts back to the stage, framing a distant Timberlake between a horn player and a guitarist whose bodies dominate the frame, as if to remind us who’s really responsible for that all-important groove. In Demme’s movies, performance is a process, not a product. Stop Making Sense, which opens with David Byrne pressing play on a boombox, plays like a time-lapse video of Talking Heads’ entire career. First there’s Byrne, alone with an acoustic guitar. Then he’s joined by the band’s three other core members, who in some cases are wheeled on stage like pieces of set dressing, and finally by a small army of backup singers and supplemental musicians. Stagehands shuttle back and forth as the ever-expanding group plays. It’s like simultaneously being behind the scenes and watching from a front-row seat. Timberlake’s is a far more conventional, if exceedingly well put-together, stage show, of the kind anyone who’s been to an arena concert in recent years will quickly recognize. There’s the high-energy opening number, the down-tempo interlude where the star climbs onto a piano stool or grabs an acoustic guitar (or, in this case, both), the crowd-pleasing string of cover songs, and the final “bam, second encore!” performance of the hits you’ve been waiting for all night. It feels more like work for hire than, say, the three movies Demme made with Neil Young, where the concerts were designed to be filmed. In Neil Young Trunk Show, the middle part of that trilogy—and, for some reason, the only one not released to video or streaming—Young shares the stage with a painter who crafts a new canvas for every song he plays. (Demme used a similar idea in his great Storefront Hitchcock, about Robyn Hitchcock, although it’s difficult to make out in the cropped video version.) You’re watching art being made and then set aside, moving on to the next work before the paint has even dried. Demme’s performance movies, whether they’re focused on musicians or, in Swimming to Cambodia and The Master Builder, stage plays, make a point of keeping the audience out of the frame, the better to protect the particularity of the movie viewer’s experience. There are no cutaways to tear-streaked faces or canoodling couples telling you what you’re meant to be feeling at any given point. But that’s not possible with Timberlake’s show, which doesn’t really exist without an audience to respond to it. His every move is calculated to please—and nearly always succeeds. Sure, his lightly funked-up pop songs start to blur together after a while; even with the tour’s setlist shaved to 80-odd minutes, the movie nearly overstays its welcome. (Although seriously, no “Cry Me a River”?) But Timberlake never stops working for our approval—though he sometimes has to cede vocal duties to his backup singers in order to concentrate on his dance moves. It seems both appropriate and inevitable that the tour would conclude in Las Vegas, where showmanship is king and you can turn a profit even with a weak hand if you’re a good enough bluffer. Timberlake is a consummate performer, although not necessarily a great one, and Demme captures him in his element, framing his dancing in long, fluid head-to-toe takes the way Hollywood’s great musical directors did. (Timberlake even borrows a move, an arms-bent 360-degree jump, from Gene Kelly, as a way of closing the loop.) Those widescreen shots inevitably take in the people around him as well, the ones Demme begins Tennessee Kids by introducing before we catch our first glimpse of the movie’s ostensible star. To his credit, Timberlake seems happy to share the screen, or at least he knows there’s nothing more appealing than a headliner who’s friendly with the less famous. As the movie’s credits, Demme even shows us Timberlake on the arena floor hours before the lights go down, playfully bantering with the production crew busy assembling the stage and lighting rigs. Chronologically, he ought to be showing us them packing up the equipment up rather than loading it in, but it’s strangely fitting for the movie to end with the beginning. This particular tour may be over, but another one will set up shop as soon as they leave. The process never ends.